In recent years, there have been doubts raised about the overall benefits of internet access and social media use. Concerns or no, the share of people who use the internet or own a smartphone continues to expand in the developing world and remains high in developed nations. 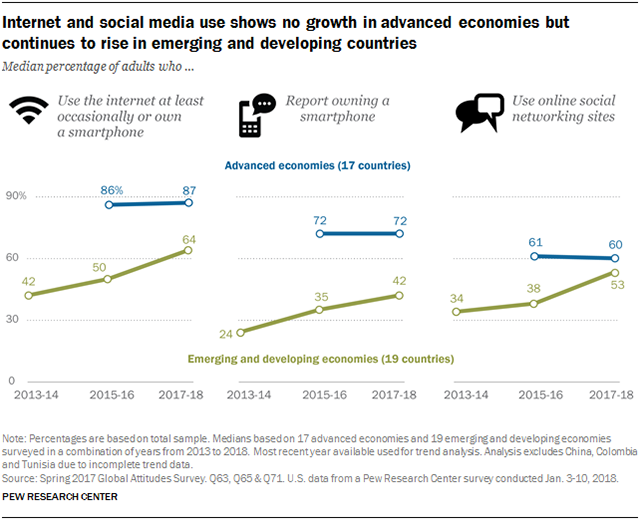 When it comes to social media use, people in emerging and developing markets are fast approaching levels seen in more advanced economies. In addition, as people in advanced economies reach the upper bounds of internet penetration, the digital divide continues to narrow between wealthy and developing countries. There has been a steady increase in internet use over the past five years among the 19 emerging and developing economies surveyed. Between 2013 and 2014, a median of 42% across these countries said they accessed the internet at least occasionally or owned a smartphone. By 2017, a median of 64% were online. Meanwhile, internet use among the 17 advanced economies surveyed has remained relatively flat, with a median of 87% across these nations using the internet at least occasionally in 2017, similar to the 86% who said this in 2015 or 2016. A similar story is seen in smartphone use. 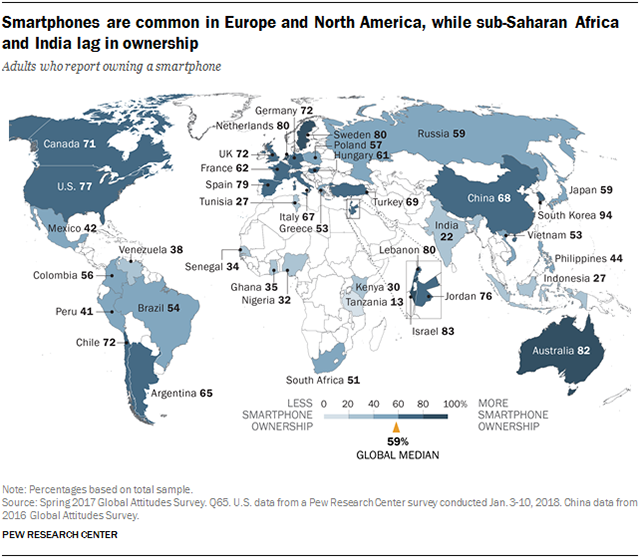 In 2013-14, about a quarter of people in emerging and developing economies reported owning a smartphone, i.e., a mobile phone that can access the internet and apps. By 2017, that share had risen to 42%. Among the advanced economies, 72% report owning a smartphone in 2017, the same rate as in 2015-16.